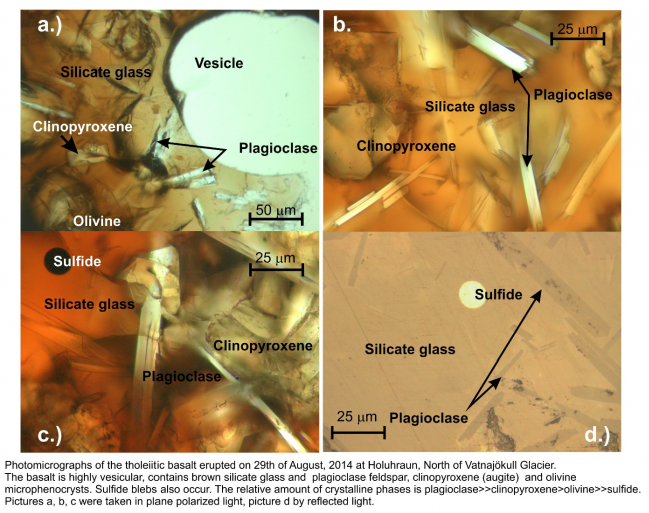 The basalt is vesicular and with about 2 volume % (vol.%) ofvisible plagioclase crystals, reaching up to 3 mm in diameter along with trace amount of clinopyroxene and olivine crystals. The groundmass is dominantly composed of brown silicate glass, but microlites of colorless and elongated plagioclase, short prismatic clinopyroxenes and olivinesare presentas well (see photomicrograph). These crystals are randomly oriented and make up about 20-25 vol.% of the rock. Sulfide blebs are present in trace amount (<1 vol%).Element concentration maps produced by scanning electron microscopy show that the sulfide blebs are Cu-Fe-sulfides containing minor amounts of Ni. The high vesicularity of the basalt indicates degassing at shallow depth in the conduit and at the surface. Loss ofvolatiles (mainly H2O)raises theliquidus (i.e. melting) temperature of the silicate melt, which promotes enhanced crystal nucleation without drop in temperature and results indegasing-induced crystallization of microlites. This abundance of microlitesexplains the relatively high viscosity of the basaltic a’a lavaformed by the 29 August 2014 event. The minor amount of sulfide blebs in the lava is noteworthy, because their presence indicates considerable sulfur-content of the melt.However, it appears that most of the sulfur from the basalt however was not released to the atmosphere during the eruption but remained trapped in the rock. Courtesy of the Petrology Group of the Faculty and Institute of Earth Sciences. Photomicrograph of the basalt erupted 29 August 2014 on the flood plain north of Dyngjujökull, North Iceland. and olivine. Sulfide blebs are also present. The relative amount of crystalline phases is plagioclase>>clinopyroxene>olivine>>sulfide. Picture a, b, c were taken in plane polarized light, picture d by reflected light. X-ray maps of Holuhraun basalt produced by scanning electron microscopy. Greater brightness indicates high concentrations and darker shades indicate low concentration for the analysed elements. 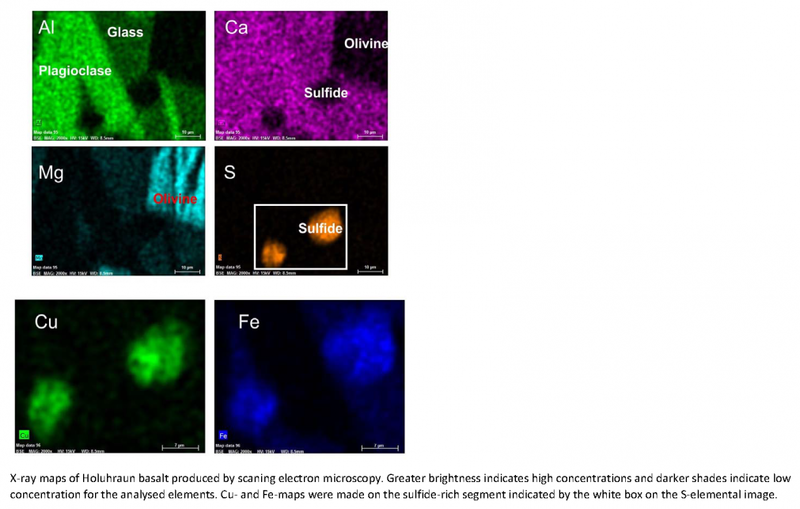 Cu- and Fe-maps were made on the sulfide-rich segment indicated by the white box on the S-elemental image. Preliminary analysis of the lava yield a composition close to that of the Holuhraun lavaflow field directly beneath the new lava (Table 1). Slight differences are, however, seen in the concentrations of aluminium and titanium oxides. These major element analyses show that relatively primitive (>7 % MgO) basalts were produced by this small fissure eruption. The outstanding question whether the magma is coming from the Bárðarbunga volcanic system (which hithereto has been the loci of the ongoing seismicity and crustal deformation) or the nearby Askja volcanic system (which is experiencing increase in seismic activity) cannot be answered by the major element data alone (Table 1). Precise analysis of trace element concentrations and isotope ratios are required to resolve this important concern.